Our weeks of late find us many times at church. We are usually gathered together as a family in the church building, waiting for the service to begin. It is quiet before the organ starts playing, and so we read the Bible passages quietly while we wait, and sometimes read the hymns that we will sing. It is a lovely time of preparing for worshipping the Lord and hearing His Word taught from the pulpit. My wonderful husband suggested we prepare in this way, and so the children and I have all followed suit. All, except for one little one who cannot yet read. And so, our dear little one, every time while we are waiting for church services to begin, asks me to read the Bible passages to her. This came with no prompting from me or anyone else in our family. But she wants to hear God's Word, for it is for little ones too. I am so thankful for her desire to hear God's Word, and it is my hope and prayer that her desire will only grow more and more. 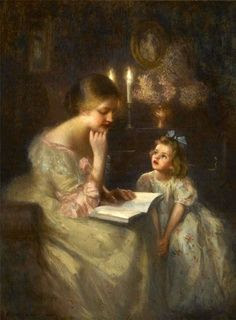 I am reminded of a time when I would read to our dear ones two simple little books for children, and also Morning Stars. I have begun reading these sweet books to the little ones again, when we have some quiet moments before bed to ourselves. I remind them to think on the truths we read, as they go to sleep. What lovely thoughts to sleep on--thoughts of Jesus Christ, our Saviour. And this is the most important thing we can teach our children--our need for a Saviour, and the love He has for His children.